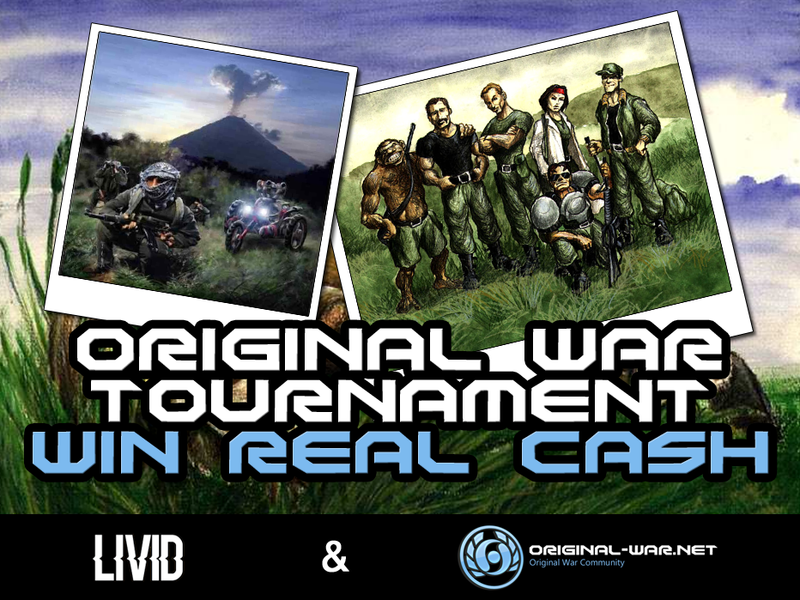 Original War Tournament 2019 - Win Real Cash! As administration of Original-War.net, in cooperation with YouTube channel: Livid, we would like to invite you to sign up for the biggest international Original War Tournament with cash prizes! Registration for the tournament starts on 20.01.2019-09.02.2019. Tournament rules below! 1st place - 50% current prize pool and the key for a random game. 2nd place - 30% current prize pool. 3rd place - 20% current prize pool. 4th place - Key for a random game. In order to participate, you need to submit a ticket for the relevant topic in the forum dedicated to this topic. The topic can be found under the link: viewtopic.php?p=55272. The tournament will consist of 2 phases: Qualification round and play offs. The 8 best players of qualification round will advance to the play off phase. We will be able to determine the exact tournament formula after the recruitment process was completed. If the required number of 8 players isn’t registered, we reserve the right to change the formula of the tournament. The tournament will be played on a Clan Base rules (current rules available at this link: https://original-war.net/articles.php?a ... matchtypes). Qualification phase will be played on „Alien Base” map. To prevent unnecesarry prolonging of the qualification matches, „Siberite Rocket” technology will become available. In the play off phase, the map will be selected via pre-game ban during which, players will receive a list list of total 3 maps, then every player will decide which map they DON'T want to play. The map that will remain as the last one, will be the one used in the play off phase. The tournament will be played on the current official version, which is 2.0.6.143 as of the time of writing. The patch may change if an official update is released before the tournament. In case a player is disconnected or Synchronization is lost,each player is allowed to repeat each game once again. The tournament organizers will verify whether the participant actually got a synchronization lost or deliberately left the game with no chance of winning. Cases of obvious loss of one of the parties are not subject to complaint. Usage of any kind of game bug, glitch or cheats is strictly forbiden. The dates of matches will be set and published in the Original-War.net forum 12.02.2019. (Link pending) The allowed time delay for your fight is 15 minutes, then the walkover will be announced. In the event of a transfer of fights, the player who doesn't match the date or time, is obliged to agree with the player with whom he wants to exchange for fights. In this case, the consent of 4 players is required (a player who wants to change the date of the fight with someone, his opponent and both players with whom he wants to change the date). Requests and approvals to change the date must be reported to the site administrator: zoNE, up to a maximum of 24 hours before the specified date of the fight. The organizers reserve the right to change the rules and regulations before and during the whole tournament. Tournament start date: 15.02.2019 (exact start time of the tournament will be published along with the date of the fights). They are at least 18 years old. Have an account on original-war.net (where we will verify the identity of players). Provide their application no later than 09.02.2019 at 23:59. Player’s nickname. (The Original War nickname must be the same as the Original-War.net nickname - this will make it easier for us to identify players). Information “I want to participate!” (for example: zoNE – I want to participate!). Last edited by zoNE on Mon Feb 25, 2019 1:20 am, edited 10 times in total. Re: Original War Tournament 2019 - Win Real Cash! Player’s draw: the draw of the order in which the players will play and the pairs and hours of play will take place on Livid's YouTube channel during a live broadcast. Then you can also ask questions about the details of the tournament. The broadcast will take place on 10.02.2019 at 20:00 CEST. Match hours: to avoid long breaks or delays, match hours are indicative hours - so some matches can take place sooner or later. Players should be on the live organizer beforehand and follow the end of the fight in front of them by looking at the forum. Due to the 15-minute delay on live, information about the players asked for the next fight will be given by the moderator in the live chat on youtube, and the password for the game will then be given in a private message on the OWN (original-war.net). Players then have 15 minutes to appear in the game, if they do not appear, victorious by default. Game speed: default in multiplayer (throughout the game). Alien Base (throughout the game). Ready to play: before each game starts, the organizer will ask in the chat room if they are ready to start the game. Changes in the choice of nation and position (it is also allowed for players to choose a random position) can only be made before the players are ready to play. When both players declare that they are ready to play, no changes are allowed anymore. Any such change when players declare themselves ready to play will result in the loss of the match on the part of the person who made the change or in the disqualification of the player. Disqualification will be decided by the judge. Use bugs: any use of bugs by a player will be considered grounds for disqualified from the tournament. This includes breaking through an opponent's BT (build time) zone, using bugs to explode characters, putting up and using building explosions (e.g. a lineup) to destroy the opponent, and any other use of bugs. Disqualification is decided by the judge. Breach of rules: any violation of the rules of the game will result in the loss of the match of the player breaking the rules or even disqualification from the tournament. Disqualification is decided by the judge. Map selection by players in the semi-final, final: the map is selected by subsequent players rejecting maps from the list of available maps in a given match. Example: there are 3 maps available (A, B and C), in the game there are two players (1 and 2), player 1 gets the possibility to reject 1 map, reject map B, then player 2 has the possibility to reject another map, reject map A - map C is the chosen map for the first game. Map C is then also blocked for use in the next fight in the match between these players (because we fight up to 2 wins). The right to reject the map in the next fight is given to the competitor who lost the previous fight in this duel. Priority in the first match of the match is given to the person who got to the final of the losing round (match number 49). In case of fight 47, the first person who is higher in the ladder blocks the map. The third fight (if any) takes place on the map, which was not used during the 1st or 2nd fight. After the maps from the pool are deplete (in the case of the final), all maps return to the pool again (you will be able to select 4 maps A, B or C in battle). The judge decides on the repetition of the fight. If the fight is repeated, it is no longer possible to repeat it again - the judge decides on further actions. Last edited by zoNE on Sat Feb 16, 2019 10:09 am, edited 3 times in total. Due to the situation that occurred during the tournament - impersonating another player - the results of the matches changed and some of the players who were involved in this procedure were disqualified. During the match 5) MarianPL vs. Sebastian, the player named Terminat impersonated the player, who received the password to play from the player Sebastian. Since during the fight the players used the same tactics and the data collected in the logs clearly indicate a person, both players, Terminat and Sebastian, were expelled from the tournament. MarianPL, on the other hand, goes on with a credited win on the account. In other words, players who lose battles 7 and 18 win match. In addition, all data of the users participating in the match will be checked more closely than in subsequent matches. A necessary requirement to start the game will be that both players receive the PW on the forum. Any similar attempts will result in automatic disqualification from the tournament. We would also like to inform you that due to the fact that a few matches will fall out of tomorrow's tournament, it will be possible to play additional games. If you want to play your Sunday match earlier (on Saturday) - with the consent of both players, we ask you to be present at the live Livid. In addition, we ask all players to wait for their fights on the same live stream, because they can start like today much earlier. the game, if they do not appear, victorious by default. Last edited by zoNE on Sun Feb 17, 2019 2:35 pm, edited 3 times in total. Last edited by zoNE on Sun Feb 17, 2019 2:35 pm, edited 1 time in total. moderator in the live chat on youtube, and the password for the game will then be given in a private message on the OWN (original-war.net). Players then have 15 minutes to appear in the game, if they do not appear, victorious by default. Last edited by zoNE on Sun Feb 17, 2019 11:44 pm, edited 2 times in total.